Drought cycle management in arid and semi-arid Kenya: a relevant disaster risk reduction model? 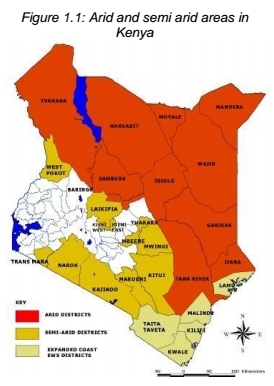 An empirical study of Garissa, Marsabit, Samburu and Wajir. Catholic Organization for Relief and Development Aid. Schilderinck tested the effectiveness of the drought cycle management model at household level in four districts of Kenya and identified four strategies that appeared to be effective in reducing drought risk to livelihoods. The four identified strategies by Schilderinck are: establishing a livestock management structure, diversifying household income, taking measures to conserve water and accessing credit facilities at the community level. As Schilderinck pointed out the four identified strategies gives an opportunity to reduce impact of drought at household level. The underlying study of the impact of disaster risk reduction in Kenya is part of the “Drought Risk Reduction Programme” (agreement ECHO/-HF/BUD/2008/01013) between the European Commission Humanitarian Aid Department (ECHO) and Catholic Organisation for Development and Emergency Aid (CORDAID). The aims and scope of this study are described in the programme proposal under result 3 “Harmonization, improved programme quality, coordination of drought preparedness and response”, activity 3.4 “Study on the impact of CMDRR compared with alternative approaches”. This report is intended for decision makers, to support the process of policy-making and strategy development related to disaster risk reduction.